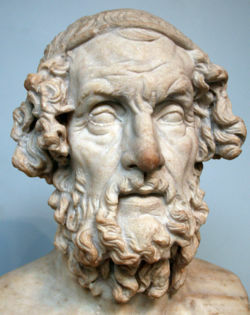 Homer ( Greek Ὅμηρος Hómēros) was a legendary early Greek poet and aoidos ("singer") traditionally credited with the composition of the Iliad and the Odyssey. The poems are often dated to the 8th or 7th century BC; whether Homer himself was a historical individual who lived during this period is debated by scholars. Tradition holds that Homer was blind, and various Ionian cities claim to be his birthplace, but otherwise there is not a lot known about Homer's life. There is no concrete evidence that shows that Homer was a real person. Greek Homēros means "hostage." There is a theory that his name was back-extracted from the name of a society of poets called the Homeridae, which literally means "of hostages," i.e., descendants of prisoners of war. These men were not sent to war because their loyalty on the battlefield was suspect, hence they would not get killed in battles. Thus they were entrusted with remembering the area's stock of epic poetry, to remember past events, in the times before literacy came to the area. It has repeatedly been questioned whether the same poet was responsible for both the Iliad and the Odyssey. While many find it unlikely that the Odyssey was written by one person, others find that the epic is generally in the same writing style, and is too consistent to support the theory of multiple authors. The Batrachomyomachia, Homeric hymns, and cyclic epics are generally agreed to be later than the Iliad and the Odyssey. Most accounts of the "Illiad" and the "Odyssey" are generally accepted to be written by Homer. Homer was even at one time credited with the entire Epic Cycle, which included further poems on the Trojan War as well as the Theban poems about Oedipus and his sons. Other works, such as the corpus of Homeric Hymns, the comic mini-epic Batrachomyomachia ("The Frog-Mouse War," Βατραχομυομαχία), and the Margites were also attributed to him, but this is now believed to be unlikely. Most scholars generally agree that the Iliad and Odyssey underwent a process of standardization and refinement out of older material beginning in the 8th century BC. An important role in this standardization appears to have been played by the Athenian tyrant Hipparchus, who reformed the recitation of Homeric poetry at the Panathenaic festival. Many classicists hold that this reform must have involved the production of a canonical written text. Other scholars, however, maintain their belief in the reality of an actual Homer. So little is known or even guessed of his actual life, that a common joke has it that the poems "were not written by Homer, but by another man of the same name," . Samuel Butler argued that a young Sicilian woman wrote the Odyssey (but not the Iliad), an idea further pursued by Robert Graves in his novel Homer's Daughter. 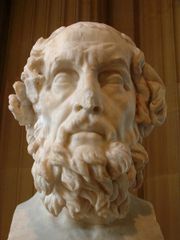 Most Classicists would agree that, whether or not there was ever such a composer as "Homer," the Homeric poems are the product of an oral tradition, a generations-old technique that was the collective inheritance of many singer-poets ( aoidoi). An analysis of the structure and vocabulary of the Iliad and Odyssey shows that the poems consist of regular, repeating phrases; even entire verses repeat. Could the Iliad and Odyssey have been oral-formulaic poems, composed on the spot by the poet using a collection of memorized traditional verses and phases? Milman Parry and Albert Lord pointed out that such elaborate oral tradition, foreign to today's literate cultures, is typical of epic poetry in an exclusively oral culture. The crucial words are "oral" and "traditional." Parry started with "traditional." The repetitive chunks of language, he said, were inherited by the singer-poet from his predecessors, and they were useful to the poet in composition. He called these chunks of repetitive language "formulas." Exactly when these poems would have taken on a fixed written form is subject to debate. The traditional solution is the "transcription hypothesis," wherein a non-literate "Homer" dictates his poem to a literate scribe between the 8th and 6th centuries. The Greek alphabet was introduced in the early 8th century, so that it is possible that Homer himself was of the first generation of rhapsodes that were also literate. More radical Homerists, such as Gregory Nagy, contend that a canonical text of the Homeric poems as "scripture" did not exist until the Hellenistic period ( 3rd to 1st century BC). The Homère Caetani bust at the Louvre, a 2nd century Roman copy of a 2nd century BC Greek original. Many passages in archaic and classical Greek poets and prose authors mention Homer or allude to him, and the eight preserved Lives of Homer purport to give the poet's birthplace and background. Modern scholarship, however, generally concludes that these accounts give no solid evidence on which to base a theory of Homer's identity. The study of Homer is one of the very oldest topics in all scholarship or science, and goes back to antiquity. Purely in terms of quantity it is one of the largest of all literary sub-disciplines: the annual publication output rivals that on Shakespeare. The aims and achievements of Homeric studies have changed over the course of the millennia; in the last few centuries they have revolved around the process by which the Homeric poems came into existence and were transmitted down to us, first orally, and later in writing. Some of the main trends in modern Homeric scholarship have been, in the 19th and early 20th centuries, Analysis and Unitarianism (see Homeric question), which were schools of thought that emphasised on the one hand the inconsistencies, on the other the artistic unity, in Homer; and in the 20th century and later Oral Theory, which is the study of the mechanisms and effects of oral transmission, and Neoanalysis, which is the study of the relationship between Homer and other early epic material. The language used by Homer is an archaic version of Ionic Greek, with admixtures from certain other dialects, such as Aeolic Greek. It later served as the basis of Epic Greek, the language of epic poetry, typically in dactylic hexameter. The cardinal qualities of the style of Homer have been well articulated by Matthew Arnold: "the translator of Homer," he says, "should above all be penetrated by a sense of the four qualities of his author: that he is eminently rapid; that he is eminently plain and direct, both in the evolution of his thought and in the expression of it, that is, both in his syntax and in his words; that he is eminently plain and direct in the substance of his thought, that is, in his matter and ideas; and finally, that he is eminently noble" (On Translating Homer, page 9). The peculiar rapidity of Homer is due in great measure to his use of the hexameter verse. It is characteristic of early literature that the evolution of the thought, or the grammatical form of the sentence, is guided by the structure of the verse; and the correspondence which consequently obtains between the rhythm and the syntax, the thought being given out in lengths, as it were, and these again divided by tolerably uniform pauses produces a swift flowing movement, such as is rarely found when the periods have been constructed without direct reference to the metre. That Homer possesses this rapidity without falling into the corresponding faults, that is, without becoming either fluctuant or monotonous, is perhaps the best proof of his unequalled poetical skill. The plainness and directness, both of thought and of expression, which characterize Homer were doubtless qualities of his age; But the author of the Iliad (similar to Voltaire, to whom Arnold happily compares him) must have possessed this gift in a surpassing degree. The Odyssey is in this respect perceptibly below the level of the Iliad. 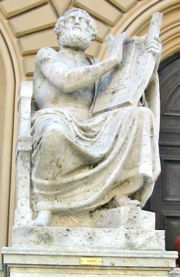 Statue of Homer outside the Bavarian State Library in Munich. Rapidity or ease of movement, plainness of expression, and plainness of thought are not the distinguishing qualities of the great epic poets, Virgil, Dante, and Milton (Dante in fact mentions Homer in Inferno IV,88, ranking him as 'Poet sovereign' just above Horace, Ovid and Virgil). On the contrary, they belong rather to the humbler epico-lyrical school for which Homer has been so often claimed. The proof that Homer does not belong to that school, and that his poetry is not in any true sense ballad-poetry is furnished by the higher artistic structure of his poems, and, as regards style by the fourth of the qualities distinguished by Arnold, the quality of nobleness. It is his noble and powerful style, sustained through every change of idea and subject, that finally separates Homer from all forms of ballad-poetry and popular epic. It may be recognized that there is an historical connection between the Iliad and Odyssey and the ballad literature which undoubtedly preceded them in Greece. 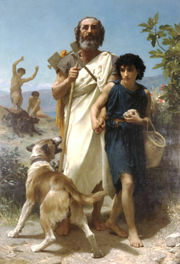 It may even be admitted that the swift-flowing movement, and the simplicity of thought and style, which are greatly admired in the Iliad, are an inheritance from the earlier lays, such as the reference to Achilles and Patroclus singing to the lyre in their tent; even the hexameter verse may be assigned to them. But between earlier days and the time of Homer we must place the cultivation of epic poetry as an art. The pre-Homeric days doubtless furnished the elements of such poetry, but they must have been refined somewhat before they gave way to poems like the Iliad and Odyssey. Another significant question regards the possible historical basis of the poems. The commentaries on the Iliad and the Odyssey written in the Hellenistic period began exploring the textual inconsistencies of the poems. Modern classicists continue the tradition. The excavations of Heinrich Schliemann in the late 19th century began to provide evidence to scholars that there was a historical basis for the Trojan War. Research (pioneered by the aforementioned Parry and Lord) into oral epics in Serbo-Croatian and Turkic languages began to convince scholars that long poems could be preserved with consistency by oral cultures until someone bothered to write them down. The decipherment of Linear B in the 1950s by Michael Ventris (and others) convinced others of a linguistic continuity between 13th century BC Mycenaean writings and the poems attributed to Homer. It is probable, therefore, that the story of the Trojan War as reflected in the Homeric poems derives from a tradition of epic poetry founded on a war which actually took place. However, it is crucial not to underestimate the creative and transforming power of subsequent tradition: for instance, Achilles, the most important character of the Iliad, associated with Thessaly, has probably been added to a story where the attackers of Troy were from the Peloponnese. The Apotheosis of Homer, by Archelaus of Priene. 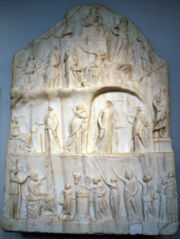 Marble relief, possibly of the 3rd century BC, now in the British Museum. In the Hellenistic period, Homer was the subject of a hero cult in several cities. A shrine devoted to Homer or Homereion was built in Alexandria by Ptolemy IV Philopator in the late 3rd century BC. This shrine is described in Aelian's 3rd century work Varia Historia. He described how Ptolemy had "placed in a circle around the statue [of Homer] all the cities who laid claim to Homer" and mentions a painting of the poet by the artist Galaton, which apparently depicted Homer in the aspect of Oceanus as the source of all poetry. A marble relief, found in Italy but thought to have been sculpted in Egypt, depicts the apotheosis of Homer. It shows Ptolemy and his wife/sister Arsinoe III standing beside a seated Homer. The poet is shown flanked by figures from the Odyssey and Iliad, with the nine Muses standing above them and a procession of worshippers approaching an altar, believed to represent the Alexandrine Homereion. Apollo, god of music and poetry, also appears, along with a female figure tentatively identified as Mnemosyne, the mother of the Muses. Zeus, the king of the gods, presides over the proceedings. The relief demonstrates vividly how the Greeks considered Homer not just a great poet, but the divinely inspired source of all literature. Homereia also stood at Chios, Ephesus and Smyrna, which were among the city-states that claimed to be the birthplace of Homer. Strabo (14.1.37) records a Homeric temple in Smyrna with an ancient xoanon or cult statue of the poet. He also mentions sacrifices carried out to Homer by the inhabitants of Argos, presumably at another Homereion.